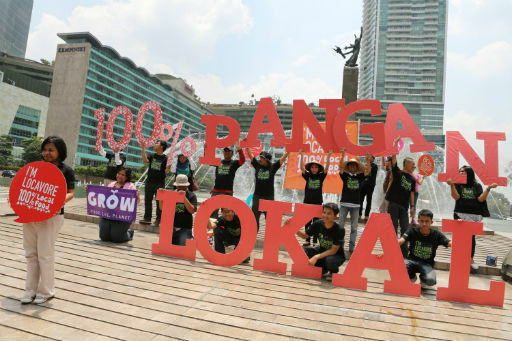 Jakarta, INDONESIA – The militant peasant group Alliance for Agrarian Reform Movement (Aliansi Gerakan Reforma Agraria-AGRA), together with other civil society organizations, assembled 700 people on October 16 during a simultaneous rally in Jakarta and Jambi on the occasion of World Food Day. “FAO is celebrating World Food Day, however, the truth is majority of the people in the world are experiencing chronic hunger and many children are undernourished. Every day, millions of people around the world eat once a day to keep themselves alive. Every night, they go to bed not certain whether they can still eat tomorrow. Asia is home to 578 million hungry people with women and children as the most vulnerable,” according to Rahmat Ajiguna, AGRA general secretary and deputy secretary general of the Asian Peasant Coalition (APC). “Indonesia is blessed with 101 million hectares of agricultural land and 790 million hectares of sea. In our forests, there are more than 800 species of potential food sources. Under the sea, there are fish and other marine resources. However, Indonesia is experiencing food problems. Twenty five (25) million Indonesians remain undernourished. Every year, Indonesian government has to spend its foreign exchange on food imports amounted to Rp 125 trillion (US$13.03 billion) or 10% of the 2012 state budget for the purchase of six food commodities in 2011, remarked Rahmat speaking in front of 500 people that joined the rally in front of the office of Trade Department and Presidential Palace in Jakarta. “Food problem happens due to massive land monopoly of the state and multinational corporations (MNCs). Because of the neo-liberal development and globalization people’s land are taken away from them for profit. As a result of the Merauke Integrated Food and Fuel Estate (MIFFE) program, land grabbing are legalized and it open-up for massive palm oil plantation, timber, sugar cane, and land rent by other state where peasants are marginalized,” added Rahmat. “The agrochemical transnational corporations (TNCs) also dominates seed and controls agriculture. The TNCs destroyed peasants knowledge on its traditional seeds and farming that are proven economical, environmental-friendly, culturally appropriate and respects biodiversity… We call to stop food speculation. We demand for genuine agrarian reform and food sovereignty,” explained Rahmat. At least 200 members of AGRA in Jambi province also organized a rally in front of the governor’s office and police headquarter. Peasants from seven (7) villages in Jambi joined the rally to declare ‘World Hunger Day’. The rally is jointly organized by AGRA, PH (Perkumpulan Hijao), CAPPA (Rivani’s NGO), and FMN (youth organization). “We condemn the government for giving PT. AAS (Agronusa Alam Sejahtera Company) a permit to put up a eucalyptus plantation in Jambi resulting to landgrabbing. The PT. AAS is subsidiary company of Sinarmas group that had concession of more than 1 million hectares of land in Jambi Province. We demand to return the peoples land,” stated Ipang, AGRA-Jambi. The statement said that the rally in Indonesia is part of the coordinated protests spearheaded by the Asian Peasant Coalition (APC). The APC members from Bangladesh, India, Nepal, Pakistan, Philippines and Sri Lanka also held simultaneous protests in declaring “World Hunger Day” on October 16. The coordinated protest action aims to emphasize the real situation that landlessness is worsening by large-scale land grabbing of local and foreign investors in agriculture which aggravates chronic hunger experience by the rural poor..Having no land to till makes them more vulnerable of hunger.